This summer I decided to teach myself how to draw something on demand – a party favor if a student makes a request. Give me a blank piece of paper, et voila. My version of the balloon man. The feeling resurfaced because V, my oldest, has some mad skills in the art department. I bought her this book to practice basic form. Step by step we drew trains, flowers, and frogs together. I felt inspired. A gift of childhood is curiosity and constant learning/growth. It’s your job. As adults, it’s easy to lose touch with the personal growth mindset. I nudged the child inside, and brainstormed to find my subject. I naturally landed on the Eiffel Tower. First, I’m a French teacher, and I’d like to teach my students how to draw it. 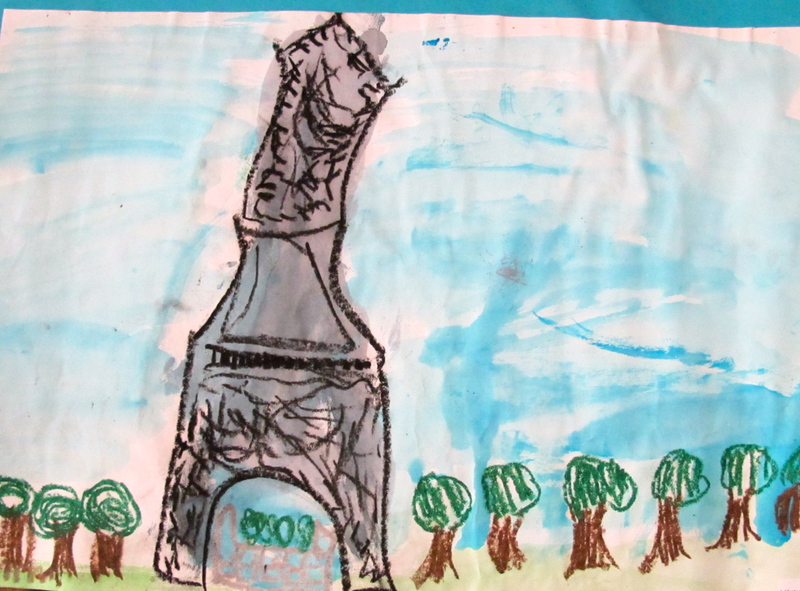 Second, I love the picture (above) that V painted in Kindergarten. Plus, La Tour Eiffel is a world favorite: Millions of people flock to the giant on the banks of the Seine every year. I combined this tutorial and this one. YouTube is genius when it comes to self-teaching. The hardest part for me: Holding off self-judgment. My drawing skills are remedial at best – left behind in grammar school. My besties in college were art majors – and let me tell you, I envied their skills. Creating tangible art from a blank canvas is fresh and invigorating. See, I like fine arts. Unlike my friends, though, I lack technique and training. My inner critic popped by: An artist? Ha. Get real. This isn’t your thing. Thoughts are a powerful tumbling block to attaining a new skill. They can wreck havoc and cause murky chaos in your mind. Art is an observational game, but also very much a mental game. Internal beliefs can be crippling if left unattended. If you keep on thinking you can’t draw, sing, dance, tell a joke, guess what? You won’t. 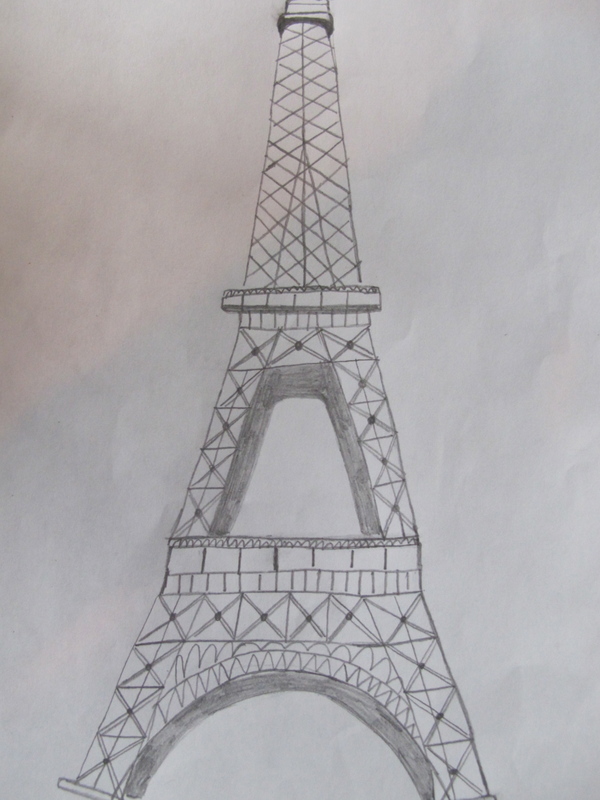 Even as I took joy in the process of drawing the Eiffel Tower, my inner-critic tried to step in front of me. Truth be told: I am a recovering perfectionist. My inner-judge likes to push me around. He’s a bully: mean, insensitive, and determined to hold me back. Patience and Practice. A growth mindset recognizes that basic abilities can be developed through dedication and hard work—brains and talent are just the start. As in all activities, my skills can improve as I learn basic principles and practice, practice! The key to learning to draw, just like learning to write, is working until you own it. A Cognitive Shift. If I keep engaging my inner critic, I am firing up the left side of my brain. The left brain focuses on words and numbers (read: logical, rational, sequential) while the right brain focus on visual images and patterns (read: holistic and free-association). Focusing on the process instead of the end product helps with that. So What? – When I start to think what if…?, I stop and reframe the question to so what? A so-what mentality is a weapon in a ruminator’s arsenal. Thinking so what opens the door for an action plan in lieu of what if’s fearful stagnation. Why Not? Why shouldn’t I do this? I want to do this … so I’m going to just keep diving in. I plan to keep at it, so I can teach my middle schoolers how. The Eiffel Tower is painted every 7 years and takes about 18 months to paint using lead free paint. What can you draw? Is there a new skill you’re yearning to hone?